Before you can choose which chair you want, you need to determine which style of chair style best fits your child's cast. If your child is already in their cast, this should be pretty easy. If your child has not had surgery yet, you will need to talk to their doctor to find out how their legs will be casted. If your child's cast looks like this, they should fit in any of my Rockin' Chairs or Animal Crackers chairs. With older kids, the casts can be different shapes. 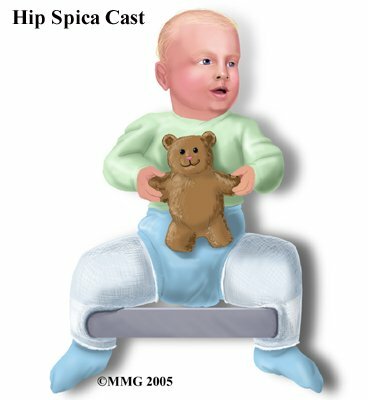 Some casts have the child's legs with little or no bend in the knees, and with the legs down in more of a standing position. These "standing" casts can be harder to fit because there is very little space between the legs for them to sit on anything. I developed a chair design that will accommodate these casts, as long as there is at least 3" at the narrowest point between their leg (where they will sit). 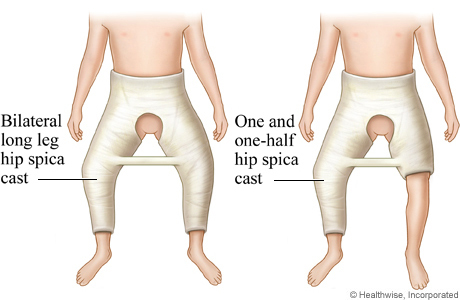 Now that you know what kind of cast you have, you will want to take a few measurements. A standard size chair is 24" wide on the inside. 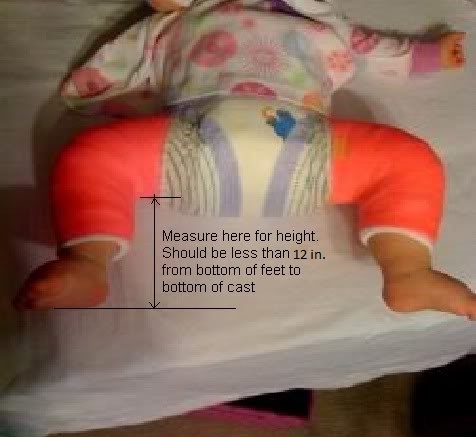 You want to give a little extra room for them to be able to wiggle their toes, so your child's cast/feet should be no more than 22-23" wide at the widest point. If your child's legs are wider than 23" at the widest point, you can either go with an Arch or Animal Cracker chair, or I could cut out shapes in the sides that would allow extra room for your child's feet. Measure the top line at the narrowest point between the legs at least 1-2 inches below the diaper area. 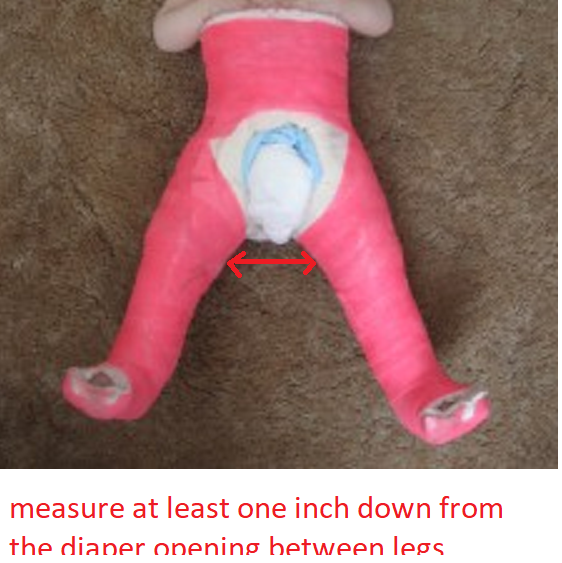 The middle line going down is the distance between the seat and the floor, do NOT measure down one leg, it has to be an imaginary line straight down from the diaper area to where the floor would be if they were standing up. The bottom line is how wide to make the chair. 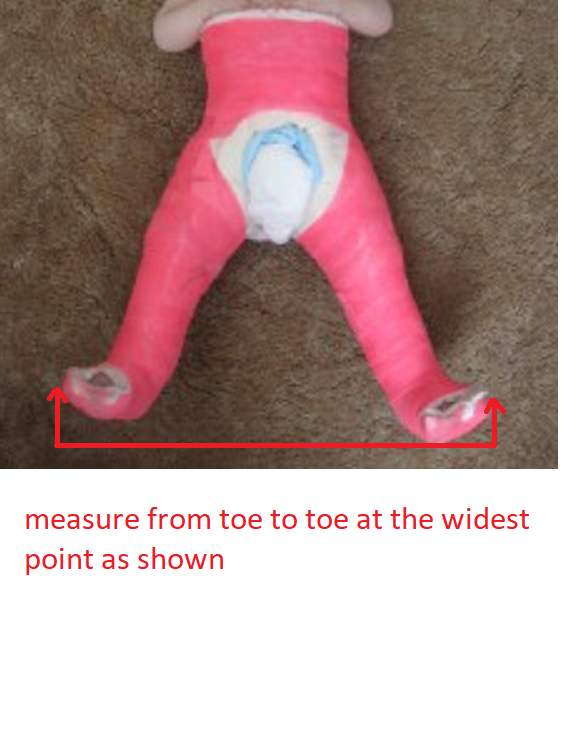 Measure the OUTSIDE of the cast at the widest point, usually at the ankles or toes if their feet are pointing outward. If your child has a "standing" type cast and the middle measurement (diaper area to floor) is less than 12 inches, you can choose a Jellybean or most of the Rockin' Chairs, if the measurement is longer than 12 inches, you can choose one of the Arch or Animal Crackers chairs. Once you have decided which kind of chair is right for you, please contact me at ivyrosechairs@gmail.com to place your order or to ask questions.